Context: Leukemia is the most common pediatric cancer. Diagnosis and treatment of childhood cancer may have adverse psychological effects on children and their families. Aim: We examined the effectiveness of positive thinking education on anxiety, depression, and quality of life of mothers of children with leukemia. Settings and Design: This randomized control trial has been conducted during August-September 2017, on 30 mothers of children with leukemia who randomly allocated into two groups using 30 random numbers produced by computer software and assigned to intervention (n = 15) and control (n = 15) groups. Materials and Methods: Data collection tools included depression, anxiety, stress scale-21, and MOS 36-Item Short-Form Health Survey quality of life questionnaire. Statistical Analysis Used: The normality of data distribution examined using the Kolmogorov–Smirnov test. Then, data were analyzed using descriptive methods (mean, frequency, and percentage), Chi-square, and independent t-test. Results: There were no statistically significant differences between the study groups in depression, anxiety, and quality of life variable at baseline (P > 0.05). However after the intervention, results showed significant differences between the study groups in all the three variables in posttest compared to the pretest. The mean scores of depression and anxiety respected, in the intervention group were significantly lower than the control group (P < 0.001) and (P < 0.004). Furthermore, significant differences were found between the study groups in quality of life score (P < 0.05). Conclusion: Positive thinking training reduced anxiety and depression and increased the quality of life of mothers of children with leukemia. Cancer is the second leading cause of death in children between the age group of 1 and 14 years old  and its most common type is leukemia., Leukemia accounts for about 30% of all cancers in children under the age of 15 years old. A recent study it was reported the most common cancer among children in Iran are the hematology system, brain and central nervous system, and lymph nodes. The childhood leukemia is one of the most prevalent malignancies (30.5%). The present randomized controlled trial aimed to evaluate the effect of positive thinking training as compared to usual treatment, on mothers of children with leukemia referred to the Oncology Unit of Bou-Ali Sina Hospital in Sari in August 2017. This center is located in Mazandaran in northern Iran. This study was approved by Research Center in Azad University and an ethical consensus was received from the Ethics Committee under the Research Deputy of Azad University (IR.IAU.SARI.REC.1396.78) which is fully compliant with the Helsinki Declaration of 2008. The participants were randomly allocated to two groups using 30 random numbers produced by computer software and assigned to intervention (n = 15) and control (n = 15) groups. The statistical study population consisted of all mothers hospitalized leukemic children. The sampling method is convenience. To determine the sample size, according to previous studies, and considering the α = 5%, test power of 80%, and probably 20% sample loss, 30 mother of children with leukemia were selected (15 in each group). Eligibility criteria included the ability to speak fluency in Farsi, Resident of Mazandaran province, willingness to participate and provide written consent, meeting the depression, anxiety, stress scale (DASS-21) questionnaire for depression and anxiety. Mothers were excluded if their child was in medical crisis as determined by the oncologist and a history of psychiatric disorders such as schizophrenia, bipolar disorder, and serious suicidal thoughts confirmed by clinical interviews, performed by a trained nurse based on the Diagnostic and Statistical Manual-IV. The tools used in this study included as follows: (1) demographic questionnaire (2) DASS questionnaire and (3) The MOS 36-Item Short-Form Health Survey (SF-36). Demographic information questionnaire included 12 questions (age, marital status, occupation, educational level, social support status, place of residence, number of children, history of psychiatric disorders, and history of using psychiatric drugs) for the mother and (other underlying diseases, cancer in other organs or other physical diseases, and history of another surgery) for the child. DASS questionnaire includes 21 items that were designed by Lovibond in 1995 to measure psychological constructs of depression, anxiety, and stress. In this study, anxiety and depression subscale of (DASS) were used. Acceptable estimates of reliability were obtained for the scale as a whole via internal consistency and test re-test reliability. Cranach's Alpha for depression and anxiety were 0.85 and 0.85, respectively. As well, test-retest reliability coefficients were 0.77 and 0.89 for depression and anxiety, respectively. The MOS SF-36 consists of 36 items that are mainly used to study quality of life and health made by Ware and Sherbourne. It has 36 expressions and eight fields of physical function, physical role, emotional role, vitality, mental health, social performance, physical pain, and general health. The subject's score in each of these fields varies from 0 to 100, and higher scores show a better quality of life. The validity and reliability of this questionnaire have been confirmed in the Iranian population and internal consistency coefficients of eight subscales are between 0.70 and 0.85, and their test-retest coefficients with a 1-week interval are between 0.43% and 0.79%. Positive thinking therapeutic package provided some cognitive and behavioral skills according to positive thinking and applied positivism by Susan Quilliam translated by BaratiSadeh and Sadeghi and was used in studies in Iran. All eight training sessions were held in the hospital's classroom on 1-h weekly sessions. Session 8: Talking about the ways to bring more laughter into our life, creating confidence, and a healthy fitness habit. Posttest was conducted immediately after eight session's intervention. Written informed consent was obtained from each participant. Participants were voluntary and were informed that they can withdraw their consent to participate at any time. The positive thinking training therapists had passed the relevant courses, had the experience in this regard. All the procedures were approved by the Ethics Committee under the Research Deputy of Azad University. The obtained scores were analyzed by software SPSS version 20 using descriptive statistics (mean, frequency, and percentage), Kolmogorov–Smirnov test, Chi-square, and independent t-test. Kolmogorov-Smirnov test to assess the normal distribution of quantitative variables, Chi-square test was used to match the demographic characteristics of study groups and t-tests are used to compare groups. Demographic characteristics of participants are given in [Table 1]. There were no significant differences between the groups in terms of demographic features. The results showed that there was no significant difference between positive thinking training group and control group before the intervention in anxiety and depression mean scores (P = 0.58) and (P = 0.87), respectively. However after intervention, there was a statistically significant difference between the two groups in anxiety and depression mean scores (P = 0.041) and (P = 0.008), respectively [Table 2]. The results showed that there was no significant difference between the two groups before the intervention in all domain of quality of life except physical role (0.01). 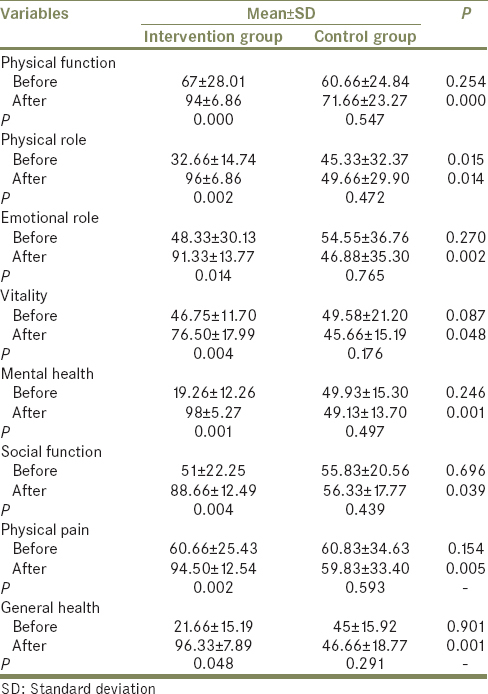 After intervention, there were significant improvements (P = 0.001) in global quality of life and in the other domains of quality of life included physical function (0.0001), physical role (0.01), emotional role (0.002), vitality (0.04), mental health (0.001), social function (0.03), and physical pain (0.005) were found in the intervention group compared to control group [Table 3]. The study results clarified that positive thinking training led to an increase in overall quality of life in the intervention group compared to the control group. This result is agreement with the previous study. In this study, researchers founded that; psycho-educational training program has a significant effect on all domains of quality of life of parent's having child with leukemia. In addition to, in recent research the authors presented, that couple therapy with a positive attitude is effective in increasing the happiness of mothers of children with special needs which has a direct relationship with mental health and quality of life. Furthermore, it should be noted that in our country (Iran), mothers are more responsible than fathers for taking care of the physical, emotional, and social needs of their children. Therefore, the provision of special counseling programs for mothers is essential. This approach may seem practical in different phases of treatment in cancer patients and could be utilized to help children and their mothers to cope with the stress of their illnesses. The current study has several limitations that the results may not be generalized. The first, small sample size limited the power of the study to detect significant differences between the two groups. The second limitation is to compare the intervention group with control group not with another intervention group. The third, lack of follow-up steps to check the stability of the results. The results of this randomized controlled trial study indicated that positive thinking training has a great impact on depression, anxiety, and several areas of quality of life in this group of mothers of children with leukemia compared to control group. Hence, using positive thinking intervention can be a helpful and supportive therapy to traditional training. Further research is needed to replicate and extend these findings. This paper is the result of a student dissertation and approved by Islamic Azad University of Sari Branch with the code of thesis 32456. Hereby, we sincerely appreciate of women that participated this research. Chang L, Di Lorenzo C, Farrugia G, Hamilton FA, Mawe GM, Pasricha PJ, et al. Functional bowel disorders: A roadmap to guide the next generation of research. Gastroenterology 2018;154:723-35. Mousavi SM, Pourfeizi A, Dastgiri S. Childhood cancer in Iran. J Pediatr Hematol Oncol 2010;32:376-82. Hopkins J, Burns E, Eden T. International twinning partnerships: An effective method of improving diagnosis, treatment and care for children with cancer in low-middle income countries. J Cancer Policy 2013;1:e8-19. Kim AS, Eastmond DA, Preston RJ. Childhood acute lymphocytic leukemia and perspectives on risk assessment of early-life stage exposures. Mutat Res 2006;613:138-60. Khazaei S, Ayubi E, Soheylizad M, Mansori K. Incidence rate and distribution of common cancers among Iranian children. Middle East J Cancer 2016;8:39-42. Karimi M, Yarmohammadi H. Seasonal variations in the onset of childhood leukemia/lymphoma: April 1996 to March 2000, Shiraz, Iran. Hematol Oncol 2003;21:51-5. Wu LM, Sheen JM, Shu HL, Chang SC, Hsiao CC. Predictors of anxiety and resilience in adolescents undergoing cancer treatment. J Adv Nurs 2013;69:158-66. Hacialioglu N, Ozer N, Yilmaz Karabulutlu E, Erdem N, Erci B. The quality of life of family caregivers of cancer patients in the East of Turkey. Eur J Oncol Nurs 2010;14:211-7. Roche V. The hidden patient: Addressing the caregiver. Am J Med Sci 2009;337:199-204. Kim MA, Yi J, Sang J, Kim SH, Heo I. Experiences of Korean mothers of children with cancer: A photovoice study. J Psychosoc Oncol 2017;35:128-47. Chen J, Liu Y, Cai Q, Liu Y, Wang T, Wang J, et al. Depression in parents of children with leukemia in Southern China accompanied by the prevalence of type D personality. Support Care Cancer 2014;22:1277-86. Cipriani A, Santilli C, Furukawa TA, Signoretti A, Nakagawa A, McGuire H, et al. Escitalopram versus other antidepressive agents for depression. Cochrane Database Syst Rev 2009;2:CD006532. Hudson TJ, Fortney JC, Pyne JM, Lu L, Mittal D. Reduction of patient-reported antidepressant side effects, by type of collaborative care. Psychiatr Serv 2015;66:272-8. Gartlehner G, Wagner G, Matyas N, Titscher V, Greimel J, Lux L, et al. Pharmacological and non-pharmacological treatments for major depressive disorder: Review of systematic reviews. BMJ Open 2017;7:e014912. Rizzo M, Creed F, Goldberg D, Meader N, Pilling S. A systematic review of non-pharmacological treatments for depression in people with chronic physical health problems. J Psychosom Res 2011;71:18-27. Naseem Z, Khalid R. Positive thinking in coping with stress and health outcomes: Literature review. J Res Reflect Educ 2010;4:42-61. Sin NL, Lyubomirsky S. Enhancing well-being and alleviating depressive symptoms with positive psychology interventions: A practice-friendly meta-analysis. J Clin Psychol 2009;65:467-87. Schueller SM, Parks AC. Disseminating self-help: Positive psychology exercises in an online trial. J Med Internet Res 2012;14:e63. Celano CM, Gomez-Bernal F, Mastromauro CA, Beale EE, DuBois CM, Auerbach RP, et al. Apositive psychology intervention for patients with bipolar depression: A randomized pilot trial. J Ment Health 2018;206:800-8. Damreihani N, Behzadipour S, Haghpanh S, Bordbar M. The effectiveness of positive psychology intervention on the well-being, meaning, and life satisfaction of mothers of children with cancer: A brief report. J Psychosoc Oncol 2018;36:382-8. Celano CM, Beale EE, Mastromauro CA, Stewart JG, Millstein RA, Auerbach RP, et al. Psychological interventions to reduce suicidality in high-risk patients with major depression: A randomized controlled trial. Psychol Med 2017;47:810-21. Rooney RM, Morrison D, Hassan S, Kane R, Roberts C, Mancini V, et al. Prevention of internalizing disorders in 9-10 year old children: Efficacy of the Aussie optimism positive thinking skills program at 30-month follow-up. Front Psychol 2013;4:988. Bekhet AK, Garnier-Villarreal M. Depression, positive thinking, personal and social resourcefulness among caregivers of persons with autism spectrum disorders. Arch Psychiatr Nurs 2018;32:823-7. Delavari H, Nasirian M, Baezegar Bafrooei K. Logo therapy effect on anxiety and depression in mothers of children with cancer. Iran J Ped Hematol Oncol 2014;4:42-8. Asghari A, Saed F, Dibajnia P. Psychometric properties of the depression anxiety stress scales-21 (DASS-21) in a non-clinical Iranian sample. Int J Psychol 2008;2:82-102. Sahebi A, Asghari M, Salari R. Validation of depression, anxiety and stress scale (DASS-21) for an Iranian population. J Iranian Psychol 2005;1:299-310. Eshaghi SR, Ramezani MA. Validity and reliability of the short form-36 items questionnaire as a measure of quality of life in elderly Iranian population. Am J Appl Sci 2006;3:1763-6. Motamed-Jahromi M, Fereidouni Z, Dehghan A. Effectiveness of positive thinking training program on nurses' quality of work life through smartphone applications. Int Sch Res Notices 2017;2017:4965816. Bolier L, Haverman M, Westerhof GJ, Riper H, Smit F, Bohlmeijer E, et al. 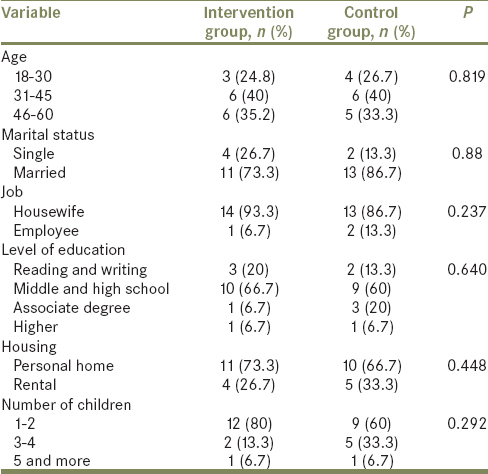 Positive psychology interventions: A meta-analysis of randomized controlled studies. BMC Public Health 2013;13:119. Carr A. Positive Psychology: The Science of Happiness and Human Strengths. London and New York: Routledge; 2013. Gander F, Proyer RT, Ruch W, Wyss T. Strength-based positive interventions: Further evidence for their potential in enhancing well-being and alleviating depression. J Happiness Stud 2013;14:1241-59. Mahmoud S, Elaziz NA. Effect of psycho-educational training program for parent's having child with leukemia on their experience and psychological wellbeing. J Educ Pract 2017;4:1-10. Ansari Y, Sanaei F. The effect of positive couple therapy on the happiness of mothers of exceptional children. Int Arch Health Sci 2018;5:43-7. Dadsetan P, Ahmadi AA, Hasanabadi H. Parenting stress and general health: A research on the relation between parenting stress and general health among housewife-mothers and nurse-mothers with young children. Dev Psychol 2006;2:171-84.